There is often a brand that goes that extra mile with their products and it is fair to say Verso is one of those brands. Christmas has arrived with Verso in the shape of this Verso Star Serum Suite and if the midnight blue coloured sleeve doesn't make your eyes dance, then the products included most definitely will. Verso is a skincare brand which was established in Stockholm in 2013. Verso's mission is to simplify your daily skincare routine by making it much more simple and straightforward and in doing so, every product has a number! Verso Super Facial Serum - As serums go, this is one of the thickest textures that I have used but it melts onto the skin in double quick time. The perfect partner to both the Day and Night creams, it is incredibly nourishing. It features a higher dose of Retinol 8 than other Verso products and alongside peptides that increase skin cell quality and renewal, the serum works to improve the skin’s texture and ability to reduce wrinkles and discolouration. Ideal for use both morning and evening, it can be used on its own or as part of your own skincare routine. Verso Antioxidant - Tumeric is the hero ingredient within this Booster and it protects the skin against UV radiation and decreases inflammation. Then vitamin E works to block damaging free radicals from the skin’s surface, simultaneously improving the skin’s hydration capacity with help from tiny microalgae. Coming together, you have a serum which is incredibly hydrating, nourishing and protective. This serum is ideal for being used in the morning and the evening and can be paired with both day and night creams. Verso Hydration Serum - If it is hydration that your skin needs, then this is the serum for you. Niacinamide is the main ingredient and its job is to strengthen the skin barrier, reduces fine lines and improves the appearance of enlarged pores. Alongside this there is the use of ceramides, Vitamin E and skin-identical fatty acids which all have an efficient antioxidant effect, defending skin from harmful environmental factors. This serum is ideal if you have dry skin, my own skin literally drinks all of this up. It can be used in the morning and the evening too. Each of these serums represents the Verso hero ingredients which are Retinol 8, Niacinamide and Turmeric and all work together to look after, nourish, moisturise and protect the skin. 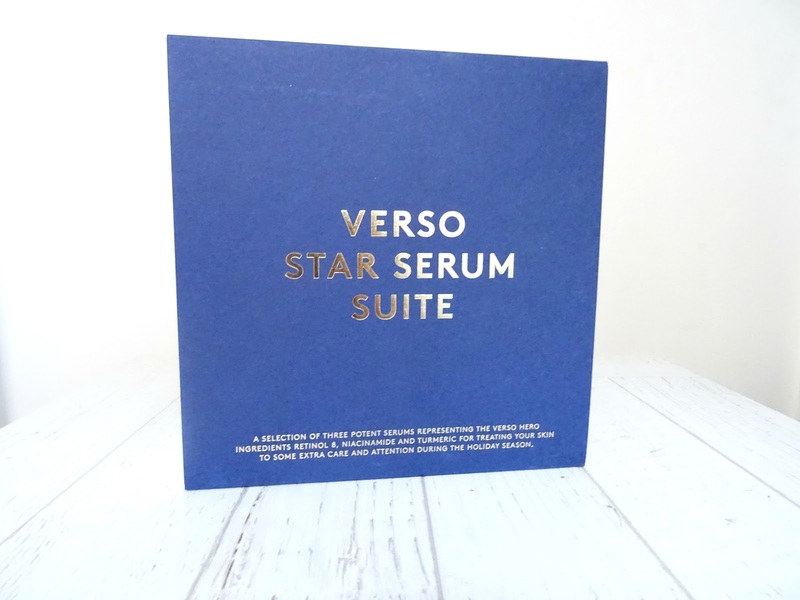 The entire Star Serum Suite from Verso is priced around £200 so it is most definitely in the luxury camp but you can also purchase each serum separately via MMCLPro here and Cult Beauty here. I need to try this brand. Seems really good! Nice products! Thanks for sharing. Verso have some really good skincare!